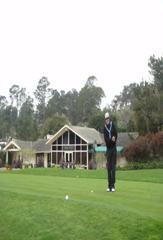 Ian Tees off at Pebble Beach, host course of the 2010 US OPEN as part of his Around The World in 80 days Trip. Ian W Halliwell is THE SOCIAL GOLFER, following a major stroke in 2006 which left this avid Golfer severely disabled and unlikely to play Golf again, Ian used Golf as a therapeutic support to put his life back on track and remarkably some 3 years later, has written and had published his first Golf Travel Book The Social Golfer which has so far raised over £ 20,000 for the Stroke Association. He his currently in process of publishing his 2nd book, LIVING THE DREAM, which includes an epic narrative of an 80 day Around the World Golf Trip, playing the Planets Finest Courses. It continues the journey in competitive golf which has seen him claim titles on all 5 continents despite his disabilities. It chronicles his continued recovery and of his day to day struggles with his illness and the amazing characters he meets on his travels. More than a Golf Book, a travel guide and life story which is both compelling and interesting. Ian now participates in many different events all round the world, this web site will have full details of these. As a Freelance Writer on Golf and Travel, few individuals have as much first hand knowledge of the Golf Travel Industry.